Today, Hello Hopeful is SO much more than that to me - it’s a place to tell my story, get real, and share what’s important to me. If you tend to squee at animals and spend entirely way too much time on Instagram and Pinterest, then we already have a ton in common. On top of that, I’m also obsessed with all things DIY, traveling, and a glass or two of Merlot (or a fine IPA). My day job is being the Creative Director + DIY Specialist for Crafty, where I get to hang out with my besties (aka bomb video production crew) shooting DIY videos for Facebook, Instagram, and Snapchat! Outside of my 9-5, DIY is still life - decorating and upgrading my house is one of my favorite hobbies. Travelling is also very high on my list with road trips being the best way to see new countries IMO. Lastly, mental health is something I am a HUGE advocate for. 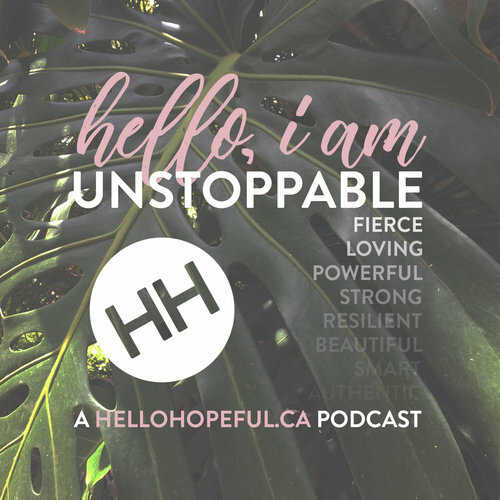 I started Hello Hopeful to share my experiences and get people talking. this too shall pass. it may pass like a kidney stone… but it will pass. 1. Where do you live? Short answer? Canada. Long answer? Right now I live in a big yellow brick house - a dream come true - in a historic neighbourhood in London, ON. Along with my husband, we also share our home with our adorable-perfect-can-never-do-any-wrong 13 year old black cat. (Luckily neither of us are superstitious, but we are a little stitious.) If you want to get to know Panther aka Bun a little better, check him out here. 2. Do you have a full-time job? Absolutely! Unfortunately HelloHopeful.ca doesn't pay the bills, but one can hope that someday, maybe it could! Alas, I am tied down to the ol' 9-5. Except my 9-5 involves either surfing Pinterest, or making crafts all day while one of my 3 best friends - err - team mates shoots a video of it at Diply.com. I really hit the job-jackpot and if you're interested in hearing how I got into it, check out my second episode of my podcast: Hello, I am a DIY Specialist. 3. What do you like to do in your spare time? Most of my hobbies surround all things DIY which I get out of my system at work, but when I'm home I love... does drinking wine count as a hobby? Netflix? Let's say gardening is a big one - I love being outside and I find touching and working in nature super grounding and relaxing, and the fact that it's a great work out is the cherry on top! Other hobbies involve learning new skills - whether it's in the kitchen trying new recipes or picking up one of my husband's guitars, I like to keep my hobbies very... varied. 4. Where are the photos on Hello Hopeful from? I don't consider myself a photographer by any stretch of the word, but I wanted images for my blog that a) weren't taken from someone else, and b) fit the overall soft vibe I wanted to put out. I started taking pictures of the small details around my house with my iPhone 6S, and used the app MOLDIV to make the photos square and threw on the filter under Spring (under Pastel) to give the bright pinky look. 5. Do you edit photos of yourself/people? Short answer? No. I will never touch up photos of myself to 'fix' anything - I get acne and cellulite, and I'm never going to hide that. I mean it when I say I'm going to be real with you all. Long answer: if and when I edit a photo, it will only be to crop it or throw the same filter over it to give it the same "look" at the rest of the photos on our website.